Oriel Sycharth Gallery, Glyndwr University, Wrexham. Collaborate! is a compact and energised survey show that explores the range of collaborative practice in contemporary art. With its focus on the social relations of production across a broad spread of media and approaches, the exhibition is inevitably diverse with multiple divergent strands and tendencies. Work by veterans of co-operative production such as Judy Chicago and Tim Rollins and K.O.S., rubs against that of other high profile figures not normally associated with shared authorship such as abstract painter Bernard Frize. But it’s the emerging and less widely known artists that provide the substance here. Perhaps the most immediately striking aspect of the show is that it works visually, despite the drastic contrasts of high and low-tech media. The curators have accommodated the most eclectic assortment of video monitors, plinth and table-based pieces, standard wall mounted works, floor standing mixed media assemblages, live performance and projection. The continuous adjustment of posture and point of view that this profusion requires of the viewer encourages a sense of close physical engagement with both the individual exhibits, several of which can be interacted with, and also with the gallery space itself as a kind of pleasure arcade in which art recovers its sense of community. Many of the exhibits take a particular cultural form as point of departure for works that subvert, expand or critique expectations. Julia Vogl’s team-built ‘Dream Machine’ zoetrope offers a homemade optical fantasia that diffuses any trace of high seriousness, whilst Kristofer Henriksson and Kezia Pritchard’s blackened ‘At Night With You’ flick book is irresistible in this context. By contrast, Jeremy Hutchison’s unopenable notebook, displayed on steel shelving with other objects that wittily deny their own use value, paradoxically acquires enhanced exchange value as an art object in the process. ‘Erratum’, Hutchison’s intervention in standardised commercial production, is documented in fascinating emails between the artist and bewildered employees of the Wuyuan Julong Precision Tool Co. Ltd in China. Nina Rodin and Dennis de Caires’ ‘Cut Paintings’ project in which the artists attempted to produce an edition of 10 identical books from a sequence of jointly executed paintings on paper, repeatedly replays a familiar repertoire of brushy improvisations in an interrogation of the singularity of the painterly gesture. The book form provides a link across to the video work via R. Lyon and Jessie Stead’s filmed recital of an interminable and bizarre text message exchange. ‘Duh Angel’ obfuscates rather than clarifies their relationship, and the accompanying book is equally unilluminating, but succeeds in blurring the transparency of language in an age of multiple urban linguistic codes. The tension between the book as mass-produced material artefact and the unexpectedly sensuous immediacy of ‘Cut Paintings’ is inverted in Cornford and Cross’s ‘Afterimage III’, which consists of four framed aluminium photo mounts from which the photographs have been torn. What would have distinguished each of the panels has been discarded and we are left with pristine blankness and uniformity. The texts that accompany each of their contributions integrate the cultural references that inform Cornford and Cross’s work with the presentation of the objects themselves, each of which preserves a solemn semantic silence. From this vantage point at the start of the show, brute materiality emerges as another subtheme. A jumble of propped paintings, gaffer tape, brightly coloured detritus and old master postcards from Tate Britain painted out except for the flesh passages, is overlooked by a suspended yoga ball. ‘Pretty Peeved’ along with its neighbouring construction by Sarah Pettitt and Robert Rivers, sprawls across the middle of the gallery insisting on clutter as a valid compositional idiom. Nina Rodin and Rebecca Molloy have managed to enact a deconstruction of the formal, aesthetic and technical resources of painting whilst reminding us that collaboration can be fun as well as challenging. Nicholas John Jones’ abstract canvas, propped alongside Nina’s simultaneously produced copy of it, signals a new kind of reflexivity about painting as a social enterprise. This aspect of the exhibition is expanded upon in Ivan Liotchev’s gigantic ‘Drawing No 9’ ; an equally exuberant and compendious meditation on communal authorship, involving contributions from 400 participants in his International Collaborative Drawing Project. Its hectic agglomeration of cartoon images, abstract flourishes and fragments of landscape sets up a new iconic democracy that detonates the myth of the marginalised and solitary painter. Collaborate! includes artists who habitually work in collectives or partnerships but there are also a number of individuals that facilitate or coordinate others through research driven strategies that re-balance the traditional artist/subject dynamic. Helen Knowles’s dystopian performance piece, during which an algorithm is tried for murder, involved professional lawyers, an actor and a unique computer, hand-built by artist Daniel Dressel. It was found innocent by the guest jury at the opening night. ‘The Trial of Superdebthunterbot’ manages to be drily humorous and disquieting at the same time. Phoebe Davies’ ‘Act 1: Astoria’ celebrates spirited old age in a video that hands a degree of authorship over to the regulars of two day care centres, whilst in ‘Welcome to Sherry #37’, Ann Liv Young’s on-screen persona lambasts the shallow young things of New York’s Soho district for their LGBT intolerant attitudes and lack of social engagement. Young works with her partner Michael A. Guerrero, whose monosyllabic responses to her rant reverse interviewer/interviewee protocols. Elsewhere in the show, video artists working with other artists as subjects demonstrate that the camera as prosthetic eye need not frame the power relations at play in the work. ‘The Future of Marriage’ by Jeremy Bailey with Kristen Schaffer puns on this powerplay in Schaffer’s subjection to a digital unicorn head, behind which she performs karaoke renditions of hit tunes. Perhaps the most impressive meditation on the nature of the artist-artist partnership is Nastja Säde Rönkkö and Ernest Truly’s ‘From City of Love’ performance (pictured) in which the pair sustained a continuous kiss in the gallery for 2 hours while enjoying the audience’s choice of music on their iphones. The collective Weast’s ‘The relation between opposing principles or forces or factors’ features Murakami Hiroshi and Tanaka Ryo in a series of surreal street tussles and rituals, and Biters’ (Larry Achiampong and David Blandy) ‘Hats of Raw’ appropriates all manner of musical content into a genuinely decentred celebration of popular culture. Both works dissolve any sense of the artists’ direct agency in a welter of samples, quotations and theatrical misdirection. 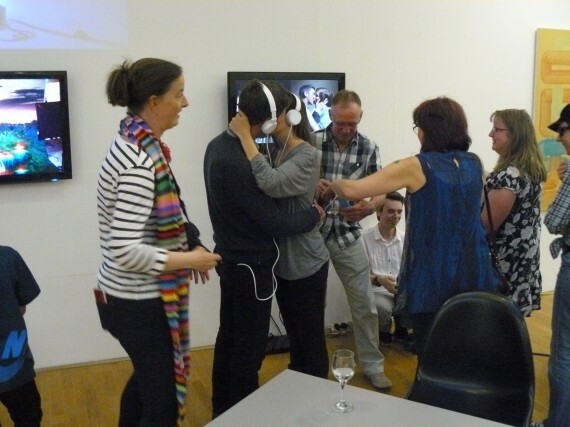 The curatorial challenge implicit in Collaborate! would seem to have been one of integrating the most diverse group of artists working across a potentially centrifugal range of issues, with only the socialised basis of their various projects providing any common ground. The abundant correspondences and dialogues activated by the show demonstrate that this challenge has been met and that collaborative practice has become a tactic of choice for artists wanting to break out of market dictated constraints and sanctions. Collaborate! reminds the viewer that every aspect of the conception, fabrication, distribution and display of contemporary art is continually being challenged and reassessed. Beyond that it invites us to engage with a panorama of possibilities and creative partnerships in which the insistence on individual artistic provenance has become irrelevant.